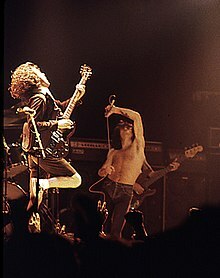 Bon Scott (9 July 1946 – 19 February 1980) was a Scottish-Australian singer-songwriter. He was the lead singer of hard rock band AC/DC from 1974 until he died of alcohol poisoning in 1980. Scott was born Kirriemuir, Scotland. He and his family moved to Fremantle, Australia in 1952. He left school when he was 15 and spent a short time in a juvenile institution. In 1964, he formed a band called The Spektors. They later became a different band called The Valentines. When the Valentines broke up in 1970, Scott joined a band called Fraternity. Fraternity left Australia and went to Europe, but came back soon after. Scott then joined a band called the Mount Lofty Rangers. In 1974 he had a motorcycle accident and was in hospital for a few months. After he left hospital he joined AC/DC. AC/DC's first two albums were High Voltage and T.N.T.. They were only released in Australia. Their first worldwide album was released in 1976. It had songs from both High Voltage and T.N.T., and was also called High Voltage. They released another album that year called Dirty Deeds Done Dirt Cheap. Their next albums were Let There Be Rock, Powerage, and a live album called If You Want Blood You've Got It. AC/DC's last album with Scott as their singer was Highway to Hell. Scott died of alcohol poisoning in London on 19 February 1980. He was 33 years old at the time. Brian Johnson became AC/DC's new lead singer. There is a bronze statue of Bon Scott in Fremantle. Shortly after his death, AC/DC released a tribute album to Scott, Back in Black. This page was last changed on 12 December 2018, at 15:43.